White Ash (Fraxinus Americana, Linn. )-A tall, stately tree, 75 to 125 feet high, with straight, columnar trunk reaching 6 feet in diameter, and high pyramidal or round head of erect, stout branches. Bark closely furrowed into many deep, diamondshaped ridges and hollows, dark brown or grey, thick. Wood reddish brown, with paler sap wood, tough, elastic, coarse, heavy, hard, not durable in soil, becoming brittle with age. Buds smooth, dark brown, plump, leathery, on pale twigs. Leaves, opposite, pinnate, 8 to 12 inches long, of 5 to 9 leaflets, usually 7, appearing late, falling early ; autumn colour purple or yellow; leaflets stalked, smooth when mature, dark green above, pale, often silvery beneath, oblong-lanceolate, with entire or wavy margins. Flowers, May before leaves, dioecious, in panicles, at first compact, later long and loose; staminate purple, later yellow, stamens 3 on short filaments; pistillate purple, vase shaped, with elongated style and spreading, divided stigma. Fruit, September, slender, dart-like keys, 1 to 2 inches long, pointed, wing twice the length of the round, tapering body. Preferred habitat, rich, moist soil. Distribution, Newfoundland and Nova Scotia to Florida; west to Ontario, Minnesota and Texas. Uses: An admirable park and street tree. Wood used for agricultural implements, frames of vehicles, tool handles, oars, furniture, interior finish of houses, stairs, and fuel. The white ash is one of the trees that holds its own in our Eastern forests, the peer of the loftiest oak or sycamore or black walnut. Narrow as its head is when crowded in the company of other trees, it can broaden out into a canopy of benignant shade when it has room to grow naturally. The white of its leaf linings enters into its name. The pale twigs and bark also justify its name. The tree is a column of grey in winter, topped by upright branches and erect, rigid twigs, set with mathematical accuracy in opposite pairs. There is little grace in such a tree until June has covered it with supple new shoots, and the leaves droop and flutter in sun and wind. Then the white ash stands transformed, and all through the summer the pistillate trees are hung with bountiful clusters of pale or rosy keys that dance and gleam and fairly dazzle the eyes of the beholder. Staminate trees ordinarily shed their flowers as soon as the bursting pollen cells have turned their purple to gold. A little mite has discovered some virtue in these flower clusters, and mite families innumerable are raised therein, causing the distorted blossoms to remain in place, though withered. I once found an old man carefully gathering these bunches in winter, thinking them to be seed of the tree. He looked incredulous when I tried to dispel his illusion, and a moment later resumed his task. In the South the white ash languishes, is undersized, and its wood of poor quality. In the Northeastern and Central States it is at its best, and is counted one of the most important of our American timber trees. It is probably put to more uses than any other species. 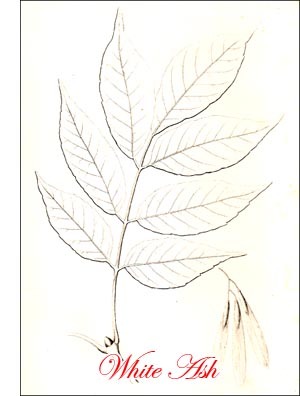 In cultivation, the small-fruited white ash (var. microcarpa, Gray) is often met with. The, clustered darts are scarce one-half inch long.